Normally RAM or Memory does not require active cooling solution (i.e. fan) and not even heatsinks or heat spreaders if you are not going to overclock it. However, RAM can heat up a lot in some cases particularly during heavy overclocking or due to bad air flow in your case even when it has heat spreader installed on it. Overheating of RAM can cause system instability and crashes which can be very annoying for anyone. So, to overcome this issue you can use RAM Coolers to cool down your memory and keep their temperatures in check. These RAM coolers come with a fan that blows air to the RAM modules and keep them cool even during heavy RAM usage or load. RAM Cooling results in stability during overclocking or when using Intel XMP profiles. These RAM coolers sit and clips on the DIMM side latches / locks and they are very easy to install and remove. Here in this post I am going to list down some of the best RAM coolers and RAM Heat spreaders that you can get if you are facing issues with RAM overheating. Here are some good RAM coolers or memory coolers with fan that you can buy for reducing your RAM temperatures and make it super stable even during heavy memory intensive operations. These RAM coolers work with both DDR3 and DDR4 RAM. 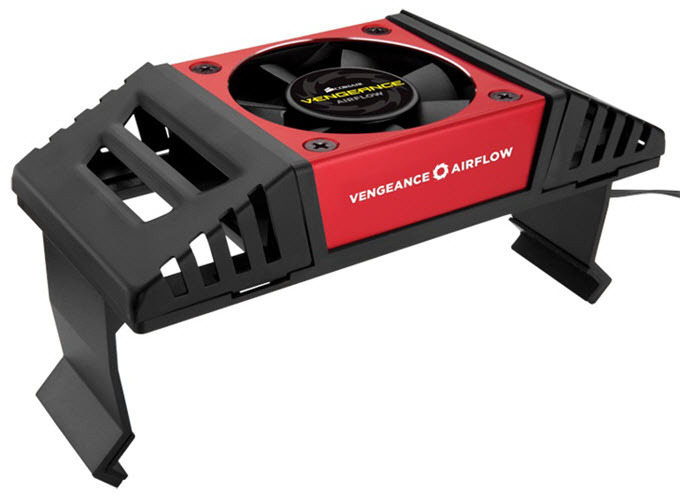 Corsair Vengeance Airflow is one of the most popular and affordable branded memory cooler that you can get for RAM cooling. This RAM cooler is pretty sturdy in construction and does a good job in reducing your memory temperatures. It supports both DDR3 and DDR4 memory and the RAM does not have to be from Corsair, as it can work with RAM from any brand. It supports maximum of four DIMMs at once. The RAM cooler is pretty easy to install as it clips to the memory latches. It has got one 60mm ball bearing fan having 2500 / 3500 RPM and it is a bit on the louder side at max speed. It generates 14.5 CFM airflow at maximum RPM / speed. The fan life is rated at 80000 hours and noise levels are at 21 dBA / 25 dBA. For connectivity, it comes with a 3-pin connector that you can plug in to the motherboard or to 4-pin molex connector using a 3-pin adapter cable. If you have a fan controller then you can adjust the speed of the fan according to your liking. It comes with red, blue and silver covers, speed control cable and a 3-pin connector. Overall, it is a great memory cooler for the price and I do recommend it if you are having issues with memory overheating. This is a high-end memory cooler from Corsair that comes with dual RGB LED Fans. This RAM cooler is designed for Corsair Dominator Platinum memory modules but can also work with other DDR4 or other Memories too. 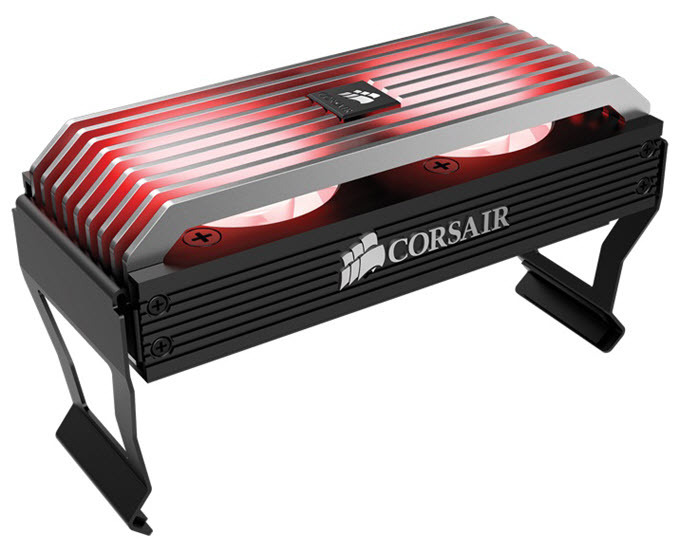 It has got two 50mm (ball bearing) RGB LED fans having PWM connector which means their speeds can be adjusted automatically or from the Corsair Link software. You can also change the color of RGB LEDs using the Corsair Link software. The fans have got maximum speed of 3700 RPM and they offer airflow of 10.6 CFM each and 21.2 CFM total. They are very quiet in operation and has maximum noise level of 25.6 dBA. The mounting system is flexible or adaptable too and you will have no trouble installing it on the RAM modules or DIMMs. The performance of this RAM Cooler is great and it does a great job in keeping them cool even during overclocking. 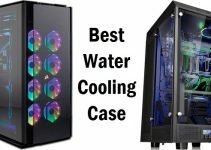 A slight downside is that it is a bit on the taller side and you should be sure about the clearance on your case or motherboard when getting this high-performance memory cooler. 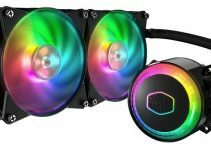 Overall, a high-quality RGB RAM Cooler that goes great with your other RGB components that includes your RGB RAM, RGB Case Fans, RGB CPU Cooler etc. Highly Recommended by me. Here we have G.SKILL Turbulence III Memory Cooler which is also a high-performance memory cooler from the a very popular memory brand i.e. G.SKILL. 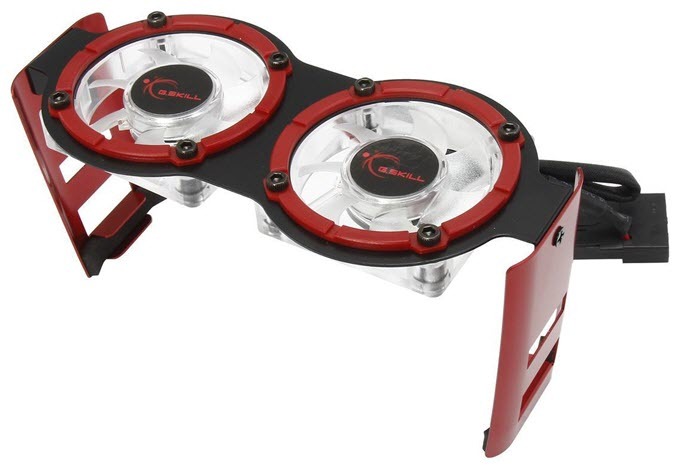 This RAM cooler comes with dual 50mm white LED fans having maximum speed of 3500 RPM. It has got 4-pin molex connector which means the speed of fans cannot be controlled and they will run at maximum speed which can be noisy at times. However, they push 8.60 CFM airflow and has maximum noise level of 22 dBA. This is a pretty slim memory cooler compared to others and its height can be adjusted depending on the clearance. You can also adjust the cooling angle on this memory cooler. This memory cooler can work with any type of RAM and is pretty affordable too. It comes bundled with an alternate mounting bracket. So, if you are looking for a lightweight, reliable, affordable, branded and slim low profile memory cooler that has delivers good performance then look no further. Here are some of the good RAM heat spreaders or heatsinks for memory cooling. 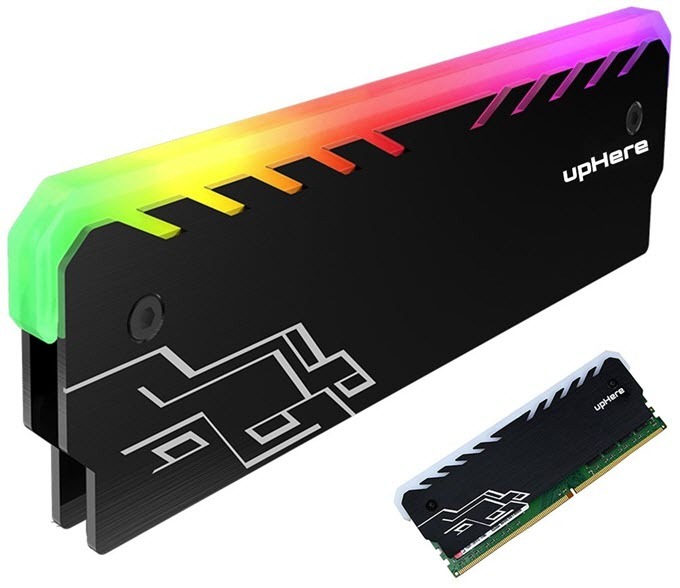 This is a RAM Heatsink that comes with fancy RGB Lighting. It supports both single and double sided DDR3 / DDR4 RAM. The heatsink is made of aluminum magnesium allow and it is very effective in keeping the memory cool. The 256 color RGB LED Lighting is powered by a 3-pin connector that you can connect to the motherboard or to the 4-pin Molex connector using an adapter cable. 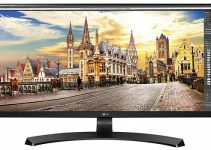 You cannot control the RGB lighting using LED lighting software which is a bit of downside, but at this price you really could not ask for more. 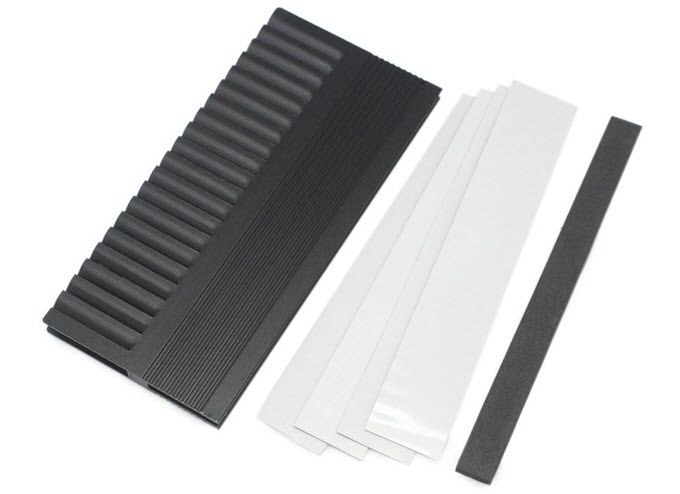 This is a generic aluminum heatsink or heat spreader that you can use with your RAM. It is not a low-profile heat spreader so you have to make sure that you have enough clearance for other components and also for it before buying it for your memory. It comes with thermal tape / pads and is quite easy to install on your RAM. Important Note: Before buying any RAM Cooler, just make sure that you have enough clearance for other components (i.e. CPU Cooler etc.) and for RAM cooler too, otherwise it will not fit and you will be just wasting your money. So, if you are facing heating issues with your RAM then these RAM Coolers are worth every try and they are pretty effective in keeping your RAM cool. The only thing that you should keep in mind is the clearance and if you have it then you don’t have to worry about anything and they are super easy to install on your RAM. If you have got any doubts or queries then please ask them by leaving a comment below.